Brittney Griner tips the ball to Maya Moore at the 2015 WNBA all star game. 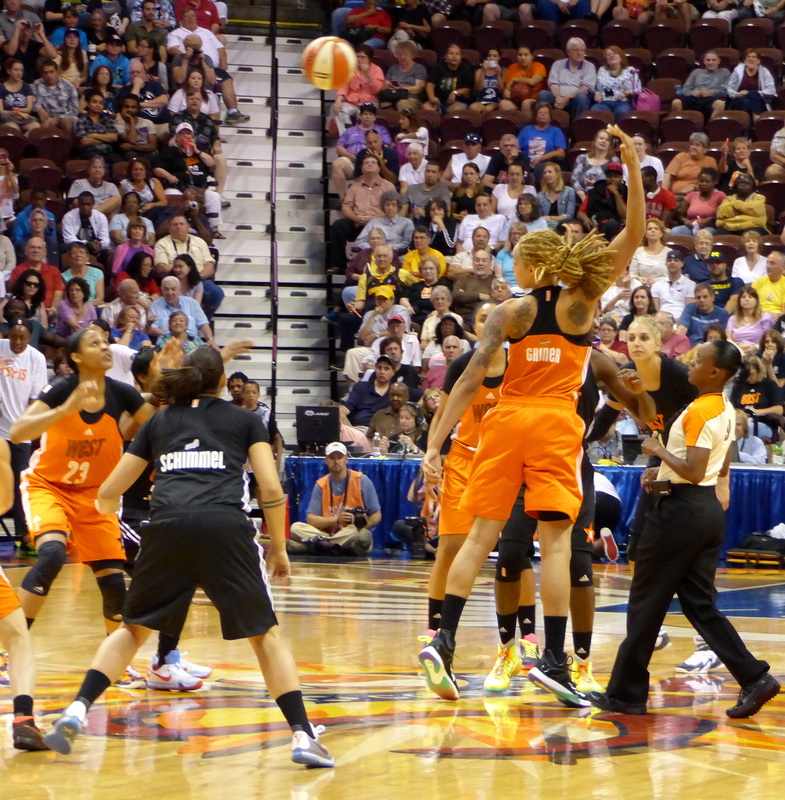 The WNBA All-Star game came to Mohegan Sun in Connecticut Saturday, July 25. Hardly a defensive struggle, the stars shot the lights out to the delight of the 8,000+ fans packed into the arena. With the score tied and less than three minutes to go, Maya Moore scored the West’s last eight points, ensuring there would be no overtime loss to the East like last year in Phoenix. The final score was 117-112, thanks to the amazing three-point shooting from Moore (6 for 10 from beyond the arc and 30 points overall) and the East’s Alex Bentley (5 for 8 from three-point land and 23 points). No surprise that Moore, a UConn grad who plays for the Minnesota Lynx, won the MVP, but Bentley’s 23 points off the bench were a surprise to everyone but her Connecticut Sun fans. 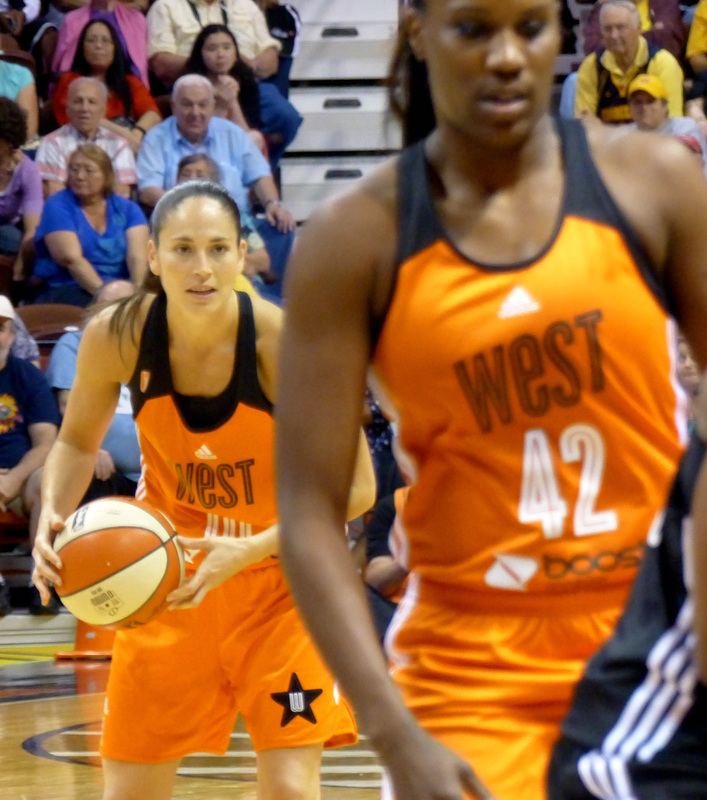 Sue Bird looks to dish the ball to a teammate. This was her ninth all-star appearance. Three of the players chosen in 2011 as the top 15 players in WNBA league history, Tamika Catchings, Sue Bird, and Cappie Pondexter, made the team again. 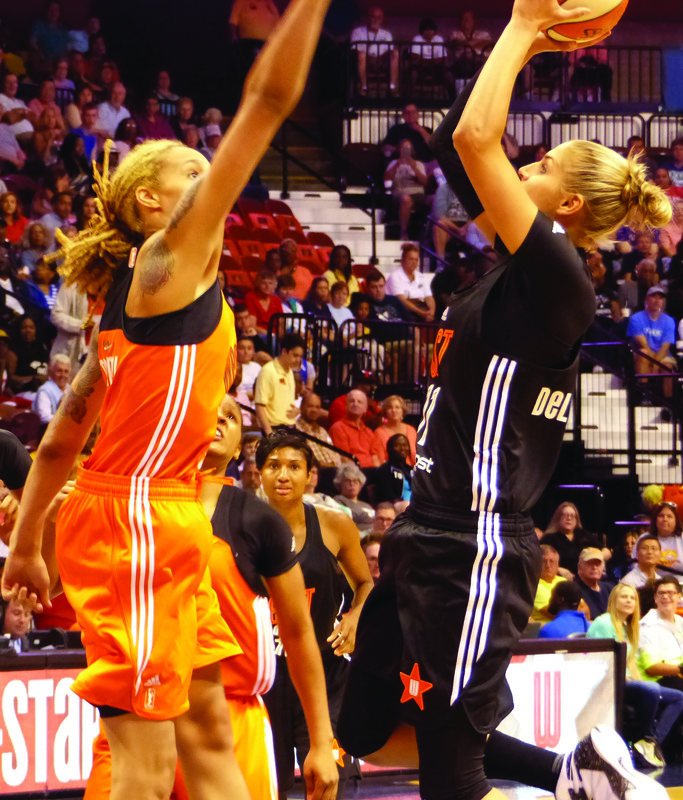 This was Catchings’ 10th and final all-star appearance. She has announced her retirement after the 2016 season, but there will be no all-star game next year in lieu of the Olympics in Rio de Janiero. 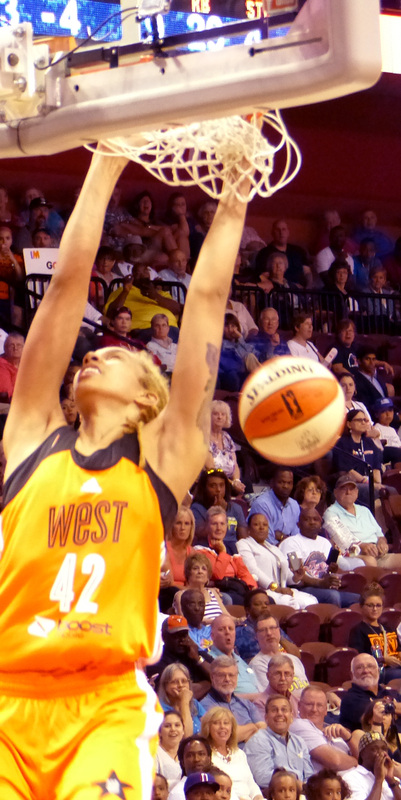 Catchings scored 8 points and became the all-star game scoring leader with 104 points in those 10 games. The East led by 10 at the end of the first quarter, with the Chicago Sky’s Elena Delle Donne leading the way. This was the third year she’s been named an all star, but the first year she’s been healthy enough to play. She ended up with 16 points and eight rebounds in 17 minutes of play. Elena Delle Donne elevates over Brittney Griner for two of her 16 points. One of the game’s highlights was a Brittney Griner rim-hanging dunk early in the second half. Griner proved that she’s put the eight-game suspension that stemmed from domestic abuse charges over the summer behind her. She ended up with 21 points, three blocks, and nine rebounds. Griner finished off her crowd-pleasing dunk by hanging around the rim for a while. Overall, the game was the crowd pleaser that everyone had come to see. There will be no all star game in 2016 because of the Olympic Games in Rio de Janiero. It will be interesting to see which all stars will be making that trip next summer!